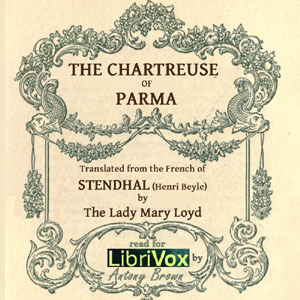 This book is more often called The Charterhouse of Parma in English, because "Charterhouse" is the English word for a Carthusian monastery, whereas "Chartreuse" is the French word. The book tells the life of a Lombard nobleman, born soon after the appearance of Napoleon's army in Italy. He has many adventures in love, war, politics, and the Church. The politics and the Church part of his life result from his doting aunt's becoming the Prime Minister's mistress, and the power behind the throne, in the Duchy of Parma.